After more than a year layoff, Sean Sherk will return to action at UFC 119 against Evan Dunham. MMA Junkie first reported the news on Wednesday, and MMA Fighting has confirmed from a source close to Sherk’s camp that the former UFC lightweight champion will be back on the Indianapolis card on Sept. 25. Sherk (33-4-1, 7-4 UFC) last fought at UFC 98 in May 2009, where he lost a unanimous decision to future champion Frankie Edgar. Following the fight, in an odd turn of events, Sherk ran from the MGM Grand Garden Arena and was tracked down nearly a mile away, still needing to submit his post-fight urinalysis. And then the injury bug hit him. Repeatedly. He was scheduled to fight at UFC 104 in Oct. 2009 against Gleison Tibau, but an injury forced him out. For a bout against Jim Miller at UFC 108 in January, a cut above Sherk’s eye forced him off the card. Then a highly anticipated fight with Clay Guida scheduled for UFC on Versus 1 in March was scrapped when Sherk was hurt yet again. But now apparently healthy, Sherk will step back in against one of the UFC’s brightest rising lightweight stars. Dunham (11-0, 4-0 UFC) is unbeaten and coming off a win over Xtreme Couture training partner Tyson Griffin at UFC 115 last month. While the judges scored the fight a split decision for Dunham, many observers believe Dunham dominated all three rounds. Prior to that, he handed Efrain Escudero, winner of Season 8 of “The Ultimate Fighter,” his only career loss. He also holds UFC wins over Marcus Aurelio and Per Eklund. Amazingly, the only four losses of Sherk’s career have come against UFC champions Matt Hughes, Georges St-Pierre, BJ Penn and Edgar. Sherk’s notable wins include Tyson Griffin, Kenny Florian, Nick Diaz, Benji Radach, Manny Gamburyan and Karo Parisyan. 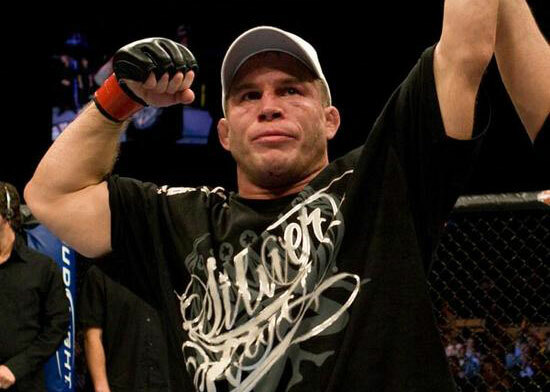 After losing to Matt Hughes at UFC 42 in a welterweight title match – the first loss of his career – Sherk spent time outside the promotion before returning at UFC 56, where he lost by TKO to St-Pierre. After a win over Nick Diaz, Sherk dropped to lightweight and beat Florian at UFC 64 for the title, which had been vacated for more than four years. But in his first defense of the belt, a win over Hermes Franca, Sherk tested positive for the banned steroid Nandrolone. He was suspended for a year by the California State Athletic Commission – a punishment reduced to six months following his appeal – and stripped of his UFC title. When he returned, he challenged Penn for the belt and lost by TKO. He has fought just three times in the last three years. The organization has not yet officially announced the event, but UFC 119 will be the promotion’s debut in Indiana and will take place at the Conseco Fieldhouse, home to the NBA’s Indiana Pacers. UFC president Dana White recently confirmed to MMA Fighting that a heavyweight title fight between champion Brock Lesnar and expected challenger Cain Velasquez, which had been rumored for Indianapolis, will not be happening on that card.